Early morning after breakfast, depart for a full day tour of Nagarjunasagar covering the fascinating island museum-Nagarjunakonda. The museum is situated in the middle of a vast man-made lake. This museum houses exquisite 3rd century relics of Buddhist art and culture excavated during the construction of Nagarjunasagar dam. A few kilometres from here we visit Anupu where more Buddhist monuments including a university belonging to 2nd century B.C. are reconstructed and preserved. About 20 kms from Nagarjunasagar visit Ethipothala Waterfalls and crocodile breeding centre. Return back to Hyderabad in the evening . Overnight at Hotel in Hyderabad. Breakfast at the hotel. Get ready for unlimited fun, thrill and excitement. At Ramoji Film City fun never ends. Seek adventure, create magical memories and discover the world full of imagination and fantasies. 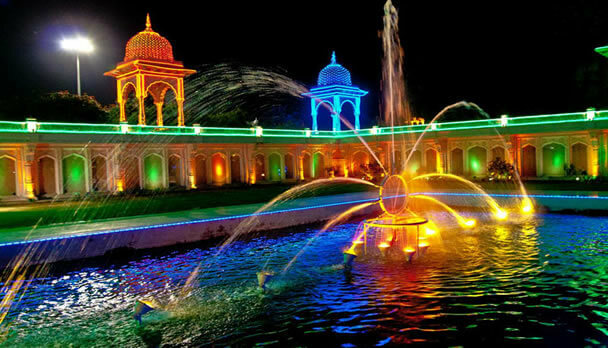 Extraordinary attractions, enthralling events, food courts, shopping and more – Ramoji Film City is the place to be for a great holiday experience. Evening if time permits proceed to Lumbini Park to enjoy the best Laserium Show of the Country.Overnight at the hotel.